SP Setia Bhd's Setia City integrated commercial hub in Shah Alam, Selangor, will have 40 office towers with green certification over the next 10 to 15 years, its chief said. 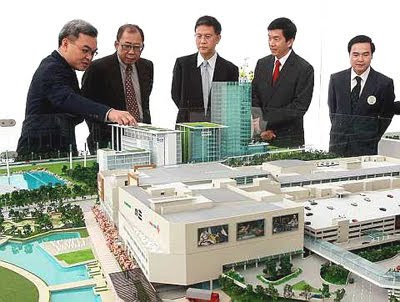 Setia City is by far the only commercial hub that will have more than 40 buildings. It will include residential blocks, four-star hotel, retail mall, convention centre, hospital and university. Setia City, estimated to be worth RM5 billion, will set a new benchmark where green development is concerned, SP Setia president and chief executive officer Tan Sri Liew Kee Sin said. According to Liew, Setia City will be the first integrated project in the country to have all its buildings certified under the Green Building Index. 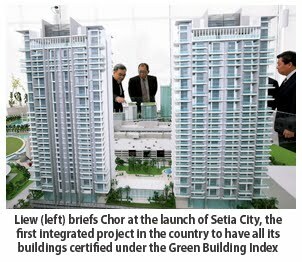 "While green buildings may not be a new phenomenon in the country, they are usually standalone structures," he said at the launch of Setia City by Housing and Local Government Minister Datuk Chor Chee Heung yesterday. Setia City, sprawled over 96ha in Setia Alam, is expected to attract local and multinational companies, Liew said. SP Setia is also selling land at Setia City and companies which buy the land can build their own towers to their specifications. To date, Top Glove Corp Bhd and Khind Holdings Bhd have bought land to set up Grade A office towers as their new corporate headquarters. Top Glove will build an 18-storey tower, while Khind is mulling over its plans. SP Setia will also set up its corporate headquarters in a nine-storey building. Ongoing works at Setia City include the 1.23 million sq ft Setia City Mall by Land Lease Australia. On the hotel, university and hospital, Liew said the company will talk to local operators to run the facilities. Meanwhile, Chor said his ministry and Bank Negara Malaysia were monitoring property price movements to prevent a housing bubble. "We are still far from a property bubble. But we are monitoring and will take action against speculators," he said. EASTERN & Oriental Bhd (E&O) is set to raise Penang's profile as a cultural and tourism attraction next year with the opening of the northern region's first performing arts centre. The RM7.5 million seafronting Penang Performing Arts Centre is part of E&O's waterfront development, Seri Tanjung Pinang, on the island. The centre will be managed by Kuala Lumpur-based The Actors Studio (TAS), which is helmed by renowned performing arts couple Joe Hasham and Datuk Faridah Merican. Located at the soon-to-open Straits Quay retail marina, the 22,000 sq ft performing arts centre will feature two theatres: a proscenium theatre that can seat 304 and an experimental theatre which can accommodate 150 people. E&O managing director Datuk Terry Tham said yesterday that RM7 million will be funded by the company for the proposed project, while the balance of RM500,000 will be borne by TAS. "At E&O, we believe in creating distinctive lifestyle experiences, as is Straits Quay, a festival retail marina like no other in Penang," Tham said at the signing ceremony between E&O and TAS in Penang yesterday. 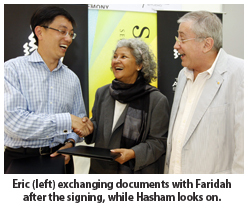 Also present were E&O executive director Eric Chan Kok Leong, Hasham and Faridah. "Penang has always been at the forefront of the performing arts scene and with this new arts centre, we can take it to a whole new level," said Faridah. Straits Quay is a 4.8ha festival retail centre and commercial development in Seri Tanjung Pinang featuring a comprehensive mix of outlets and attractions. The 270,000 sq ft centre borders the upscale Quayside Seafront Resort Condominium development. The RM1.8 billion Quayside currently serves as the region's first private waterpark within a gated community.